We evaluated 3,046 farmers spread across the country’s districts to establish baseline about climate information and climate change, in September 2016. This Info Note shares insights into the status and needs for climate services in Rwanda at the time of this survey. Coulibaly JY, Birachi EA, Kagabo DM, Mutua M, Hansen J. 2017. 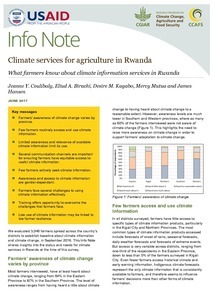 Climate services for agriculture in Rwanda: What farmers know about climate information services in Rwanda. CCAFS Info Note. Wageningen, Netherlands: CGIAR Research Program on Climate Change, Agriculture and Food Security (CCAFS).